Mike- This was # 23...but who's counting. And that's just the diesels. The track work looks good. Paul- I've slipped and slid my way to the bottom and I'm looking up already. Paul2- nice haul from York. I need to get out there one day. Mark- hope you get the paint today and have time to get some train work done. Jon- nice classic 027 layout. Patrick- The 0-4-0 looks good. Gotta work up the nerve to try weathering one day. Still need to get past keeping my trains shiny and clean. 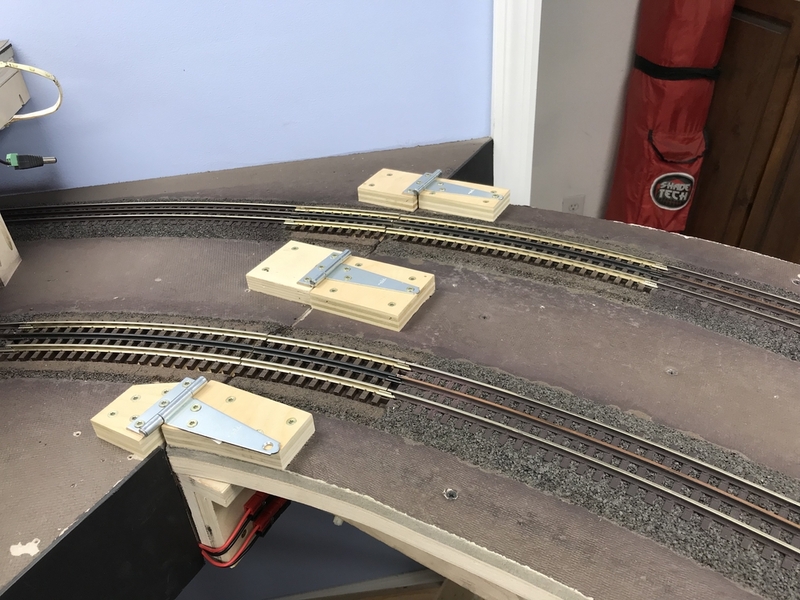 Andy- I like the changes on the hinges. Why did you mount them up in the 3/4" blocks? Structural reason or clearance issue? Rick- nice trestle. Looks great. Ralph- You're on a roll there. The loads keep coming! Mark, Reuse is my best friend & it really keeps the wife happy cause I am not spending money! I sure hope the painting went well! Johan, nice job! It that # 7 or 8 finished? Lee, Make sure when your ready and pleased to share some pictures of your wonderful work with the rest of us! Jonathan, Looks like you have a good start! Thanks for sharing with us and hope you get your ZW back soon! Ralph, Nice blue pipe! I hope you keep coming up with these ideas cause they sure are helping me out to save money down the road! Brian, All aboard; Amtrak! I see it is an Amtrak day! Johan, And another great looking one! Last weekend, I put down the Homasote and cork roadbed on my top loop, minus the area where a switch and siding will go. This weekend I hope to get the cork painted with the rock fleck spray as before, but I'm going to take the advice of Chris @lehighline to paint it first with flat gray, then spray since the rock fleck paint empties fast. I'm going to follow Bob's and Butch's suggestions about combating over-spray as well. After my first go at it, I scraped the over-spray flecks off a bunch of stuff with an old plastic discount card. The stuff came right off, but why get that stuff in the air in the first place? Patrick, thank you sir! It means a lot to me coming form you! You have such a great layout that makes one only dream! Jonathan, looks good! Your moving right along, keep up the good work! Johan, I try to keep up on great work, and yours is one of them! Hi guy and gals, I ran across this on another thread here on the forum and thought some of you might be interested in this! Hmm...fresh paint. Looks like I'm up to something. Ralph, now I cant wait to see what you come up with! I will check in later today for progress report! 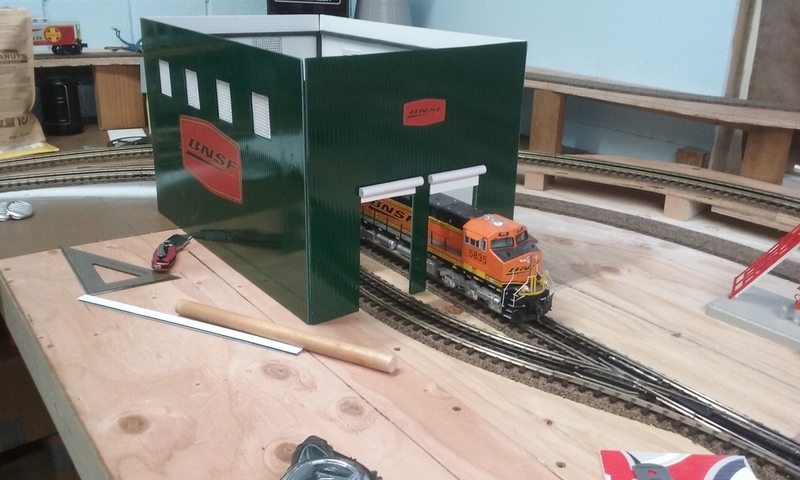 John, nice work on the Dash 8, the trestle, and landscaping. Bob, I like your NW-2, it's really sharp. Ralp, those pipe loads are something! Well done. Kevin, the clump foliage is from Woodland scenics. A large bag is roughly $18.50 I think. Thank you Lee. Nice work on the flat car. Thanks Mike. I'll see what I can do about the birds . Nice track work too. Rick R., nice work on the trestle. Paul, I like your finds at York, very nice. Dave, feel free to use that idea anytime. 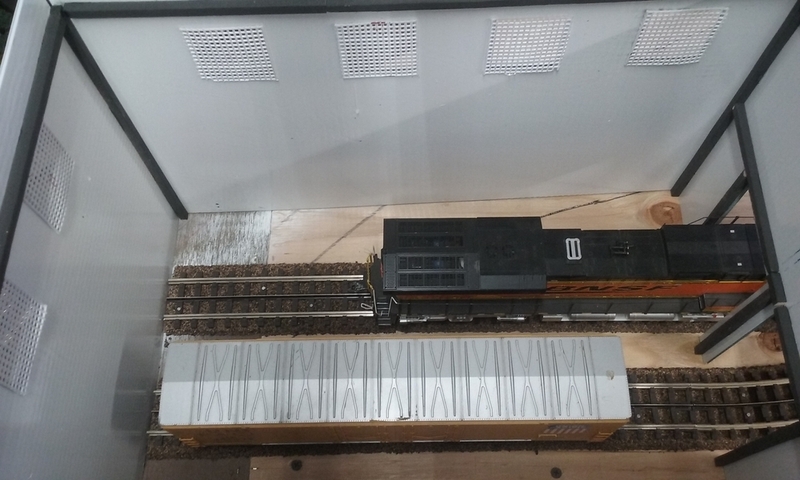 Bob, with a 1/2" block, the hinges are just slightly above the rail. It's probably overkill on 3/4" blocks, but after I camouflaged them, they look ok, and work even better. 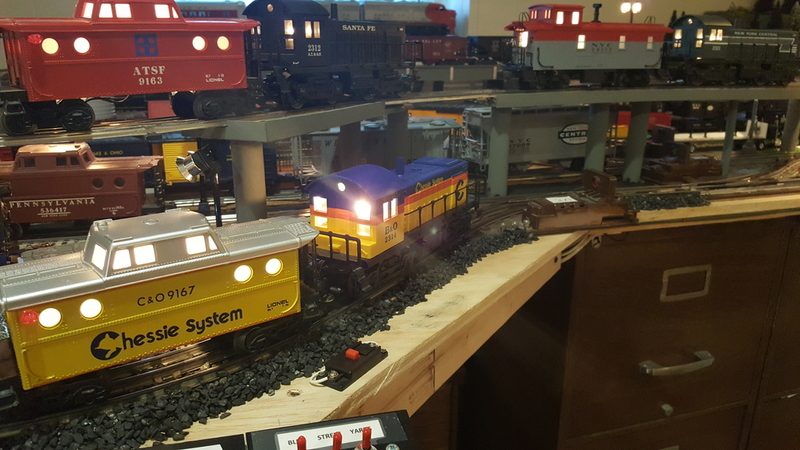 Just finished installed and assembled MTH highway crossing flashers and Azatrax relay on Conrad Sub. branch line in Beaman, Iowa. Just know I will be stealing this very clever idea. Andy... I am going to be Dave’s partner in crime and steal this idea too. Clever idea, looks great! 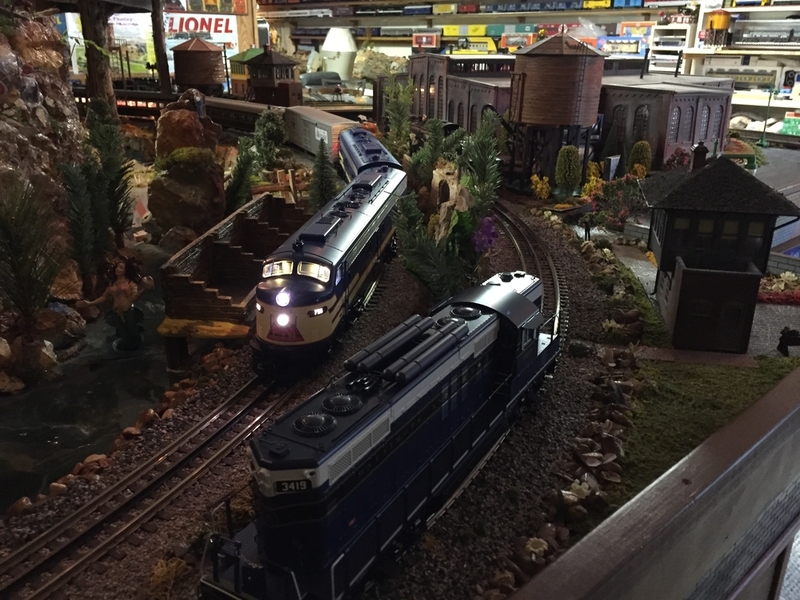 Rick R your trestle looks awesome and Mike G the track work looks great, and everyone, great stuff, thanks for posting! 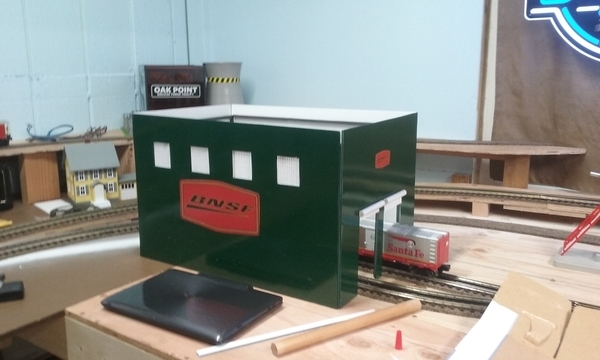 It was too cold and wet to airbrush in the garage today so I instead mostly assembled this storage transfer building kit, that had been mothballed since 2011. Wow, love those long consists. Keep ‘em coming! Lubed the new Shay. Ran trains. 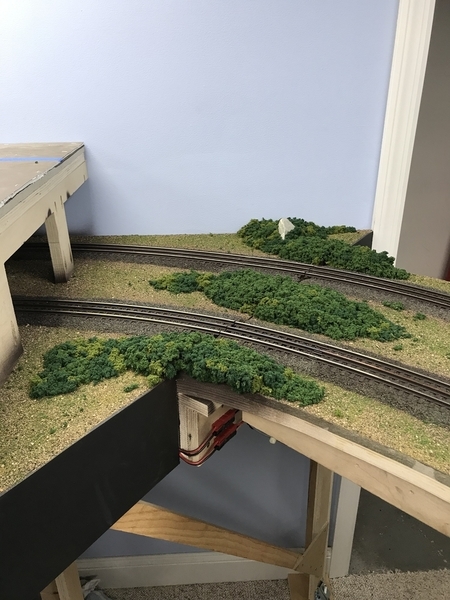 Created a spring time scene in one of the two parks on my layout, using scenery items bought at Scenic Express on Friday at York. Still have to construct a higher retaining wall ( behind fellow on park bench ) to hide the battery on/off box used for fence lights. 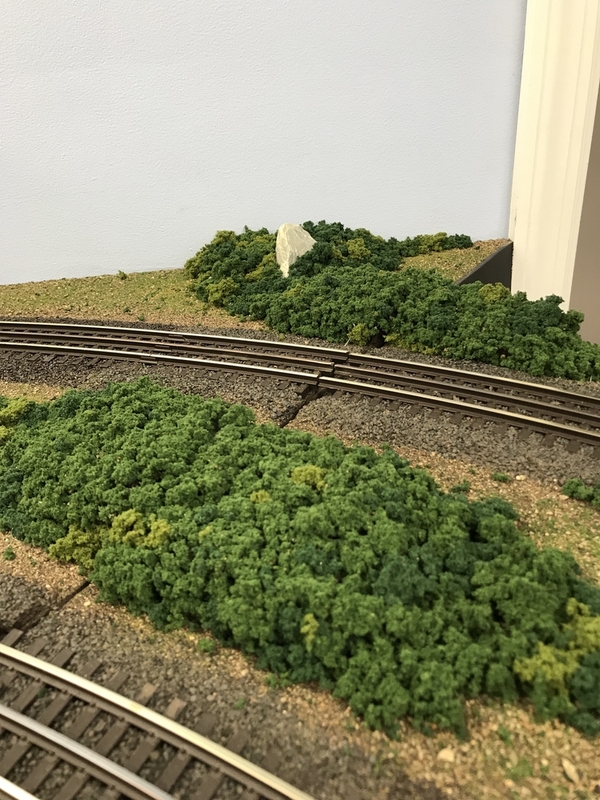 Planted some fall trees ( also purchased at Scenic Express while at York ) over on the Mt. 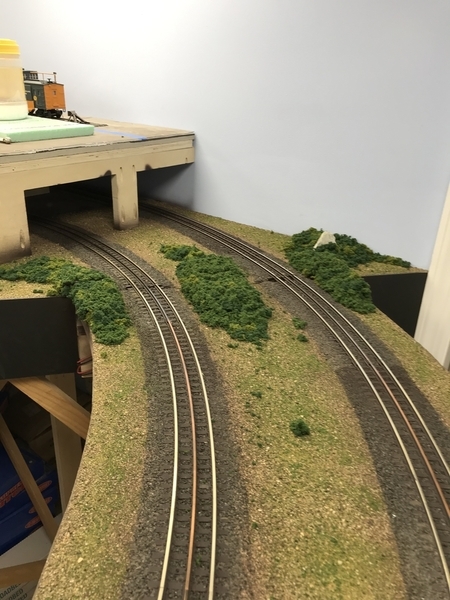 Randolph side of the layout. All in all ... had fun on this fine Sunday!! Well, I didn't get time to get the gray paint, and didn't have time to paint if I had it! There is anther day! Yes, I am behind, so I just handed out likes again. I did another incandescent to LED conversion on an MTH Passenger dome car this afternoon. Yesterday I had installed a switch in the bottom of the car so I would have the option of turning off the LEDs that will be in the dome. It took me 2 hours to install everything. Used fine magnet wire to connect those LEDs in the dome to the buck converter via the switch and a disconnect. 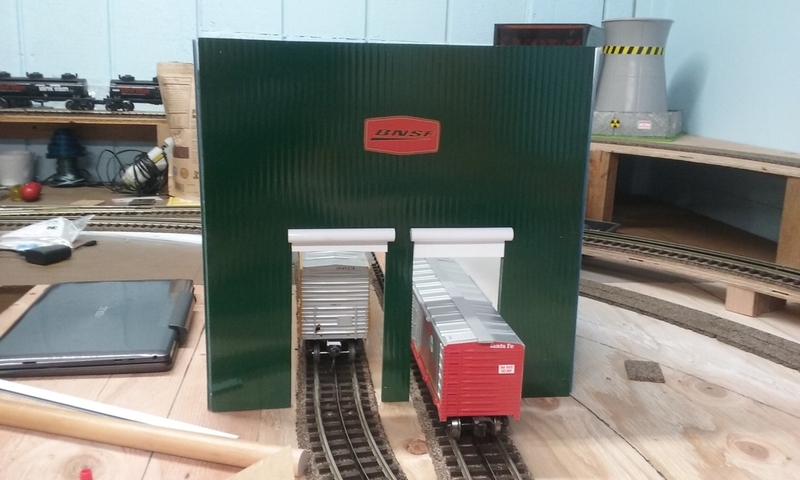 During the last week I also converted a couple of MTH ARR baggage and coach cars. 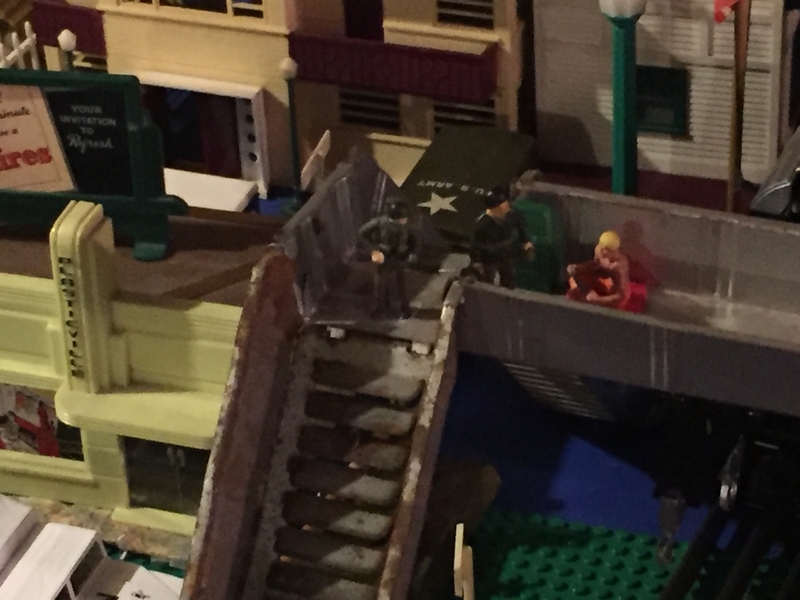 CGWFOREVER, nice job on the crossing gates! FL9TURBO2, Very nice Train! You must have a huge layout for such a long train! Very impressive! Patrick, your spring scene looks fantastic! Let the sun shine in! So now switch machines, so I spent the day working on my scratch build engine service building! I still have cross braces to install along with trim and lighting, but I am happy so far! Here are a few pictures! Larry, great work! The new lighting looks amazing! I know I will have some to do down the road, but till then, I can enjoy looking at your wonderful work! This is why I like this forum. This building illustrates something that I can do. 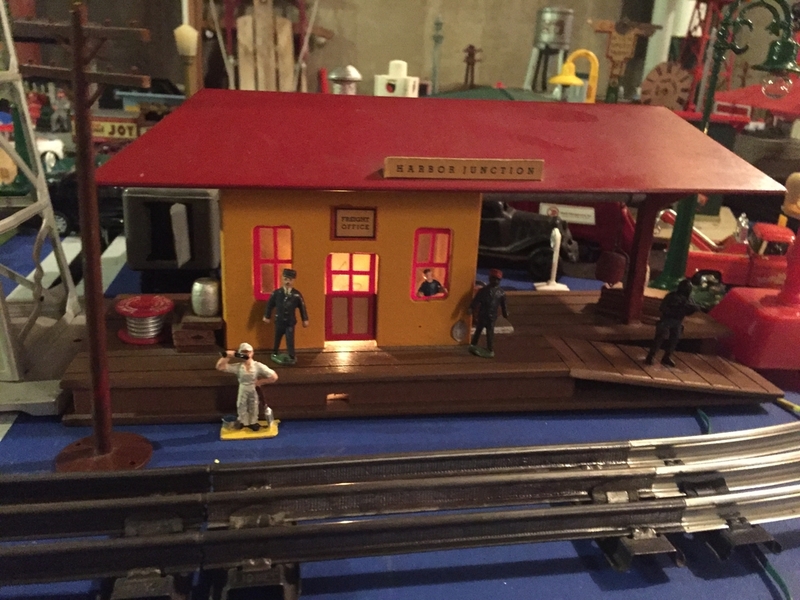 The engine building looks great Mike! You may want to add some bumpers at the end of the line. 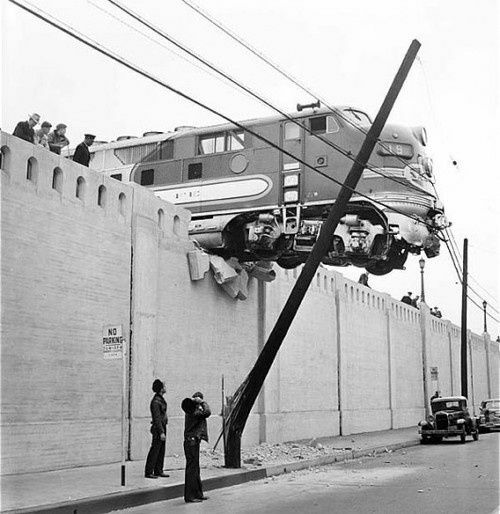 Wouldn't want a wayward diesel crashing through the back wall. Beautiful loco, Mike. Am I correct in thinking that it came with a matching caboose? Thanks Vincent: I attached a video to my post for more fun. Yes is came with the caboose. Now running Lionchief and MTH 2 different loops. Leave it to Brian to "find" the perfect photograph to illustrate what could happen to Mike G.
Old Mike, The GEVO looks great! will have to do. 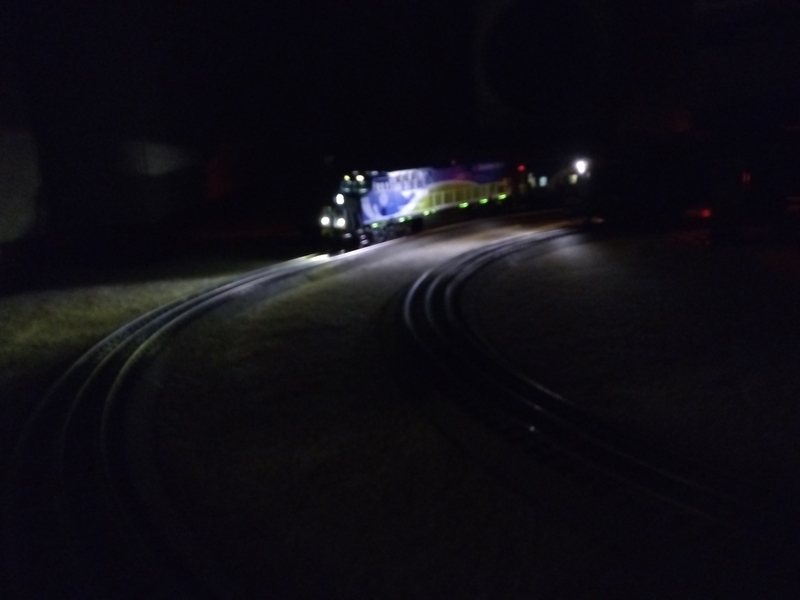 Of course you cant get the wonderful charging light effects, from a still shot. I know many here have had this engine for years, but I'am excited, as is the grandson. 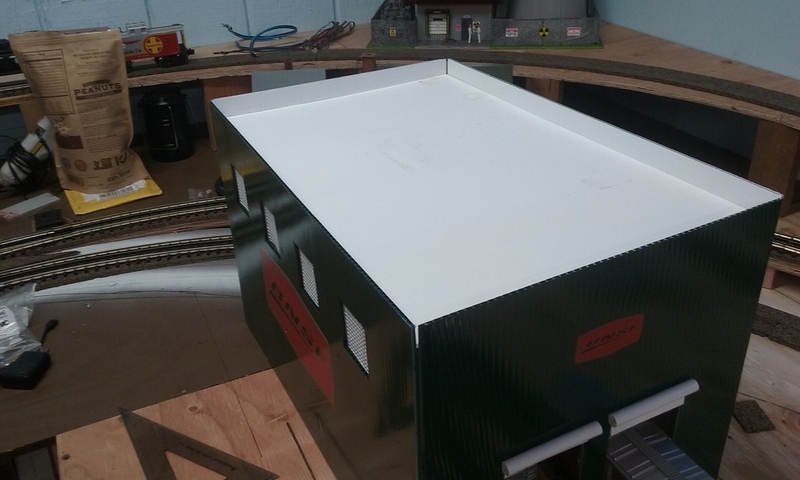 Spent time in the train room and got the roof done for the Engine building. Then the wife and I took tank for a walk, while out the big brown truck pulled up and said I have something for you, would you like me to drop it on your door? I quickly said NO I will take it now! 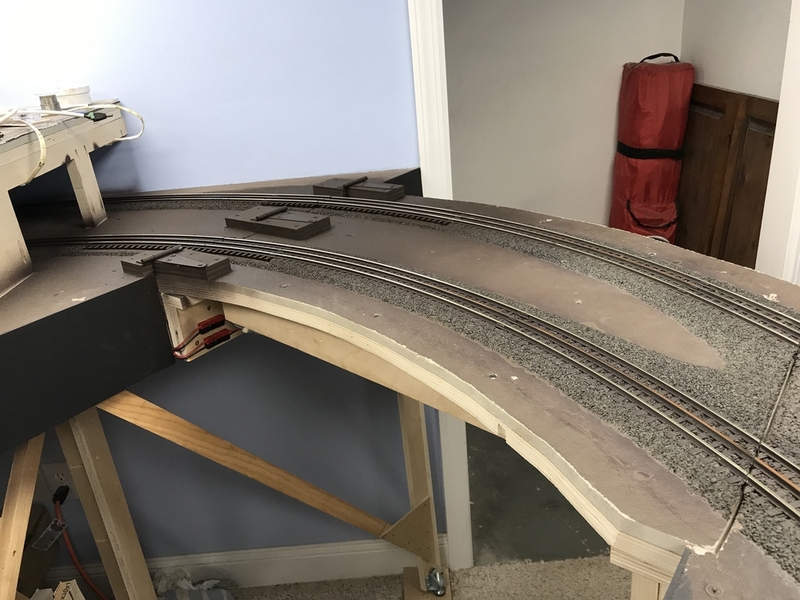 Turns out it was the 072 curves that I ordered 2 months ago! So back to the train room switching gears and laid more track. Sorry guys was to busy to take pictures, will get some up soon! 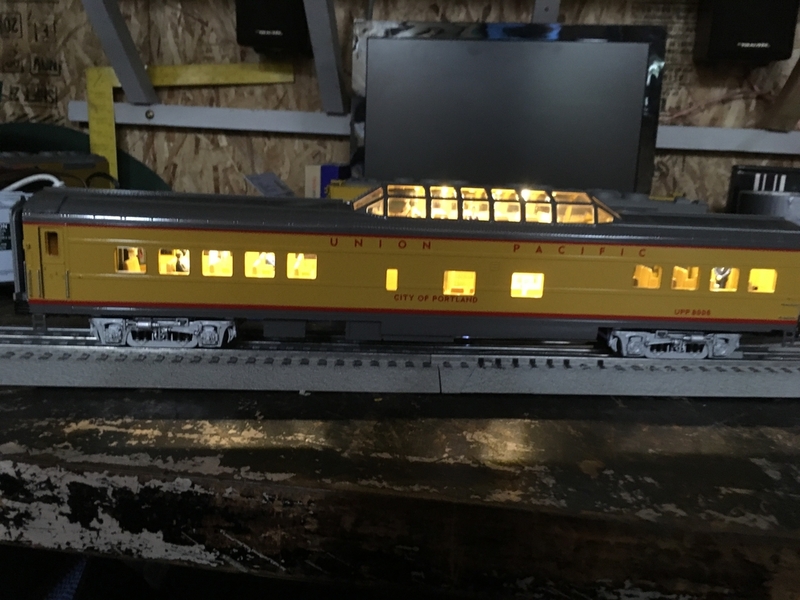 I attempted to build my first led lighted vehicle. I have purchased these in the past and I figured I would try my hand at doing my own. I got a good deal on a fishbowl bus at York and I also purchased the lighting kit from another vendor at the show. After carefully removing the base from the shell and the interior I figured why not go all in and add some interior details. 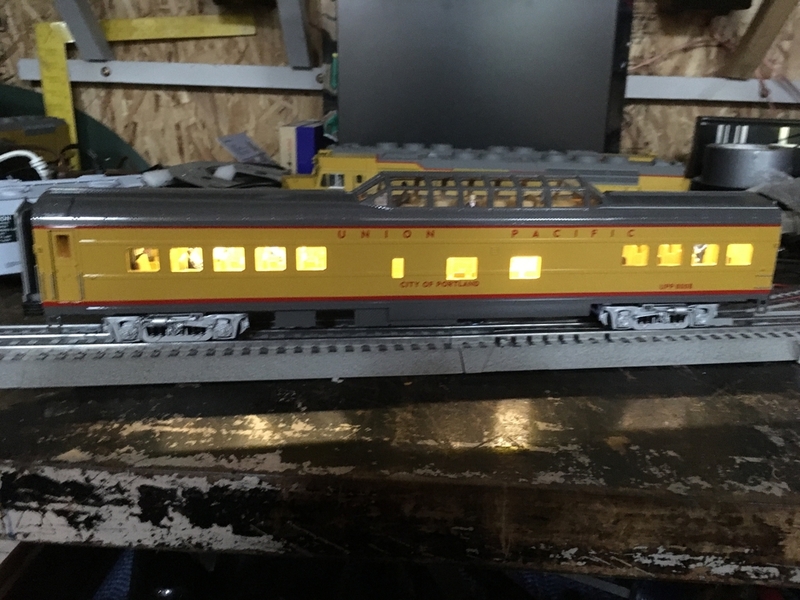 So I painted the inside and added a driver and about 8 passengers. Drilled out the holes for the lights and carefully put everything in its place. 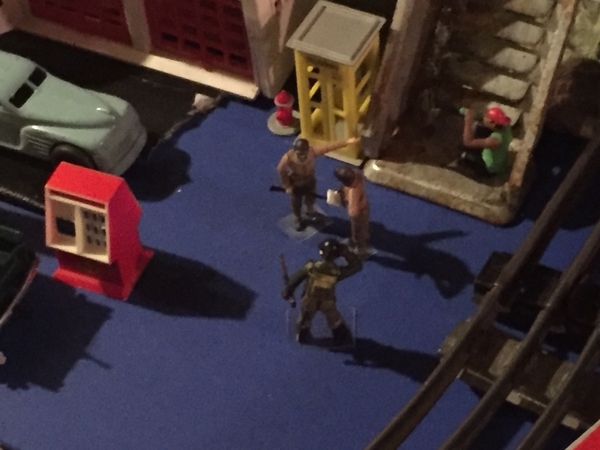 For a first attempt I must say it turned out pretty good and it only took 3 hours or in TV terms in the background 1 original Magnum PI and 2 A-Teams. I find I work better with the background noise. Then today, made some improvements instead of just playing around. 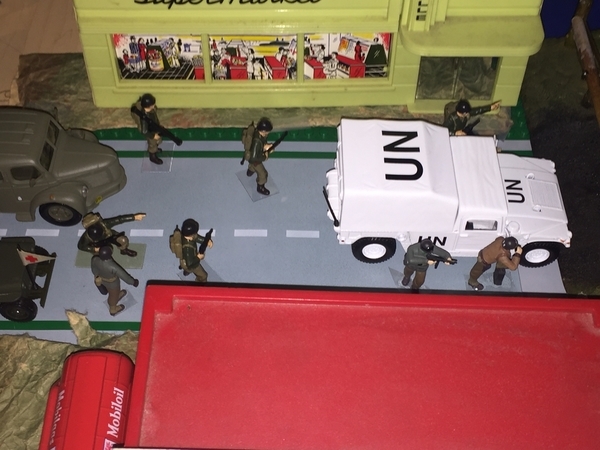 Got some more “O-Scale” Soldiers in the Mail. 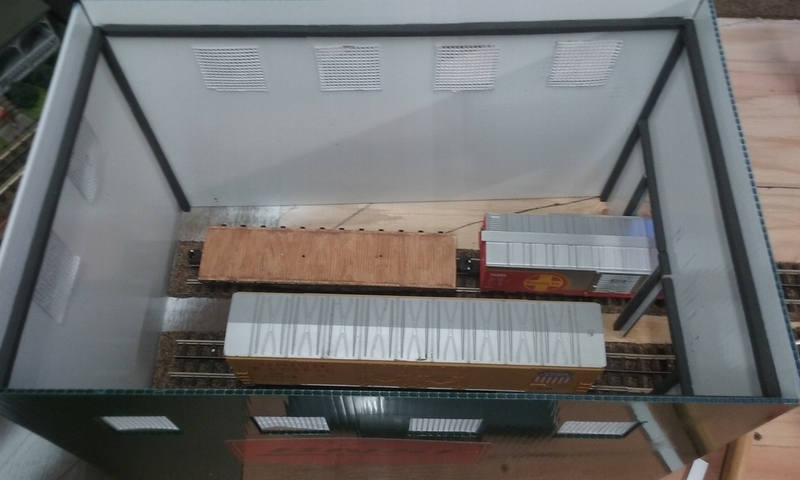 This time, made by MTH Railking. Not as good as the O-Line reproductions but close enough in height. Lieutenent giving the orders while his seargent checks over the plans(MTH). The other soldier listen to a sound in the distance. Finally got a light in the American Flyer freight station that was my grandpops. 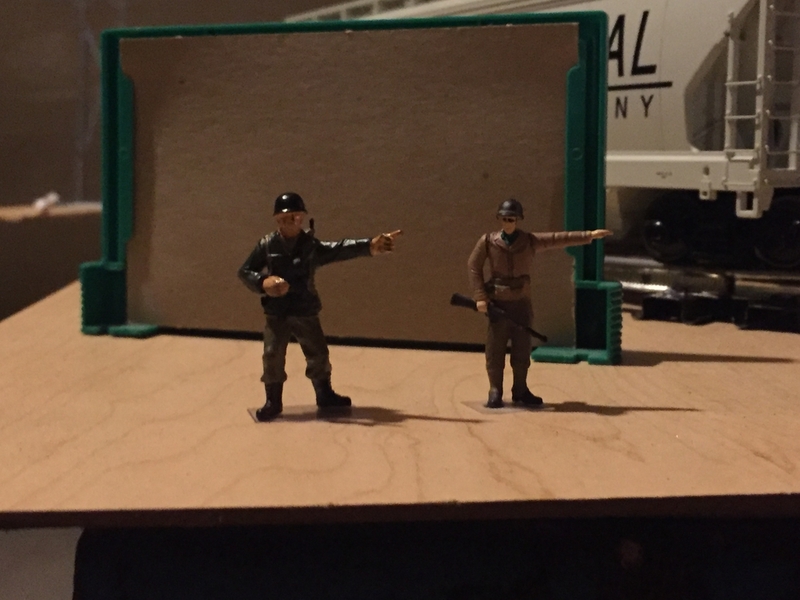 Added some more scale appropriate figures too. 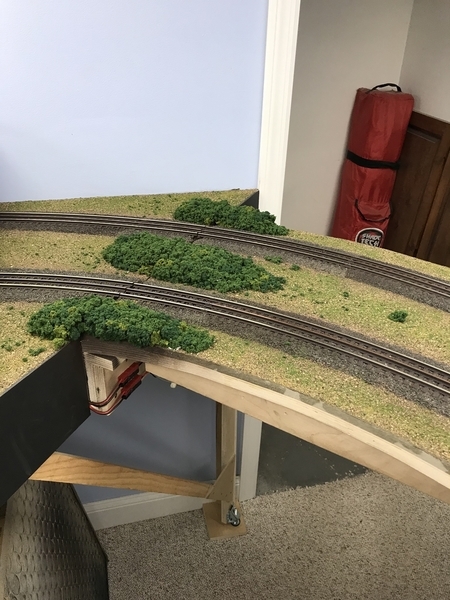 I’ve begun the process of trying out different, non tubular track for my eventually expansion. 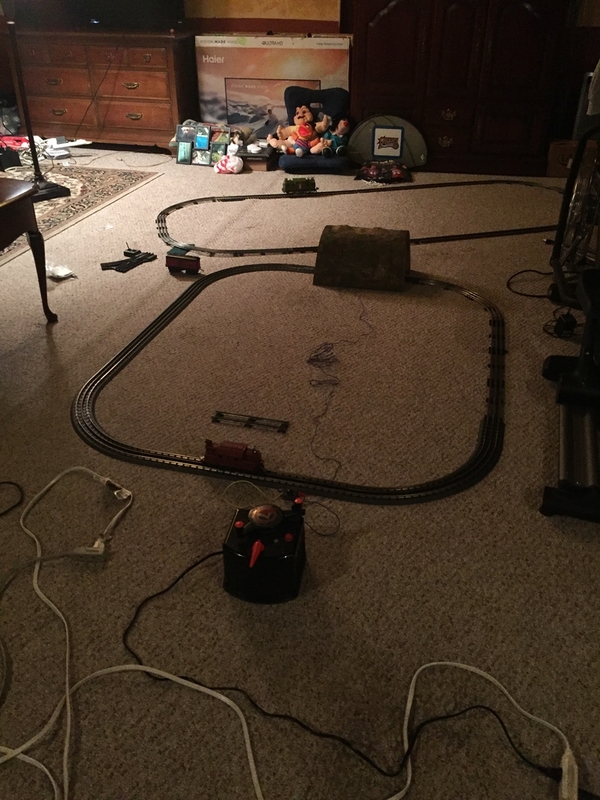 I like the RealTrax so far to the extent that I’ve begun to buy it. Came across some Gargraves from a friend and order the mating pins for it to hook up with tubular. I also liked that ha. 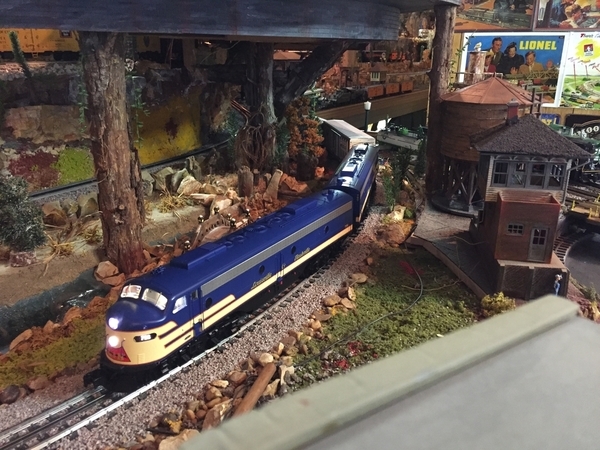 Larry, Nice looking engine and train! 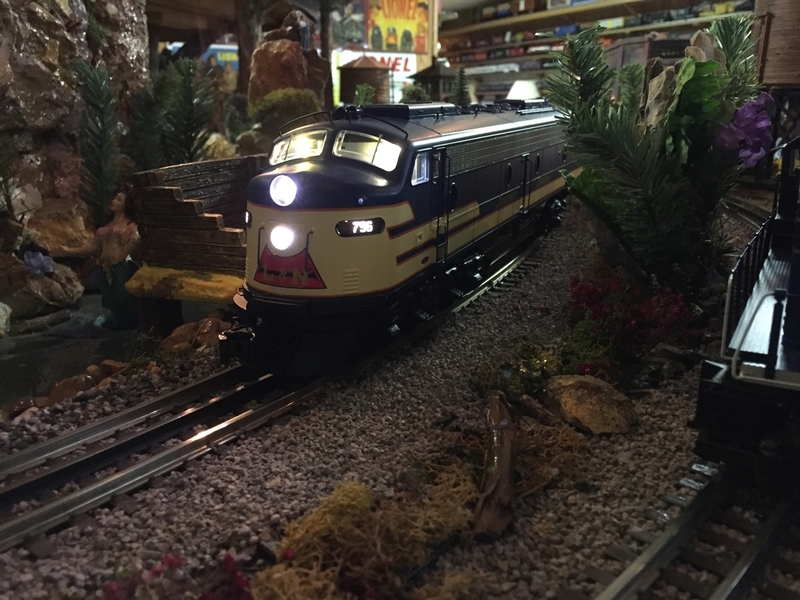 It's nice to just sit back and enjoy trains somedays! Bryan, great job on the bus! The big question is, what's next? 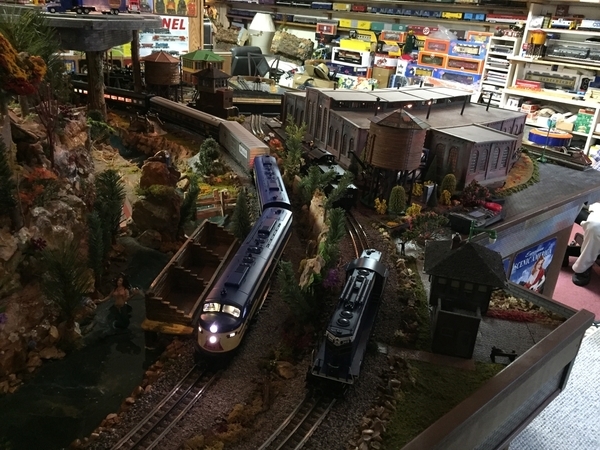 Steve, looks like you had a fun day with your trains and layout! Enjoy it all you can! As for me, no work on the train room today. Dentist first thing this morning, then work! I actually bought two of the kits just in case I screwed one up. Since I didn't do that I think I will use the other one and do my prison bus. 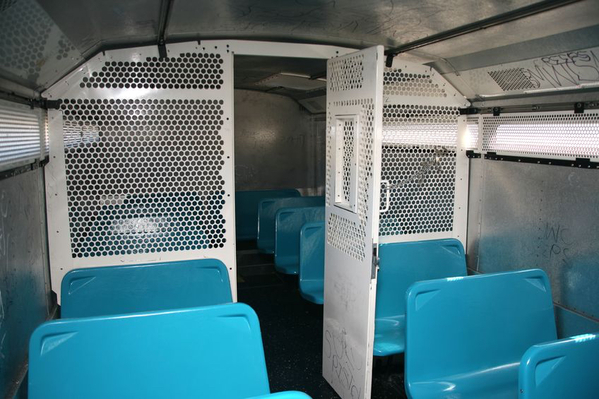 I will add a driver and a bunch of criminals to the inside; maybe even a few bars/cage to separate the front of the bus from the convicts. Love those K-line S-2's Great videos Steve. Bryan, the lit bus looks great!! Better have enough armed guards on the prison bus! Steve, The K-Lines look great! I'm sure glad the UN Peacekeeper force is on the job!! Paul, the new crossing and switches you got at York will do the job nicely to keep trains rolling in and out of the Morton facility, etc.